pleased to see "Cosmetic" updates to the place (outside) ! Overall, this was a great experience for us. We are a family of 5 and had plenty of room. Amenities were great, unit was clean and ready on time. Had everything we needed (although dishwasher is really loud :) ). Screened in patio was awesome to sit in during the evening hours - zero bugs! Walk to the beach was truly < 10 mins - just depends on your walking speed. Pool was clean and in good repair. 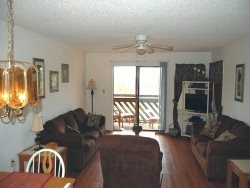 Great location to shopping, restaurants and activities. Bedrooms do get very warm if doors are closed. Ideally, adding ceiling fans would solve the issue, but having floor fans in every room is a quick and easy solution as well. We thank the owners for making this a wonderful experience all around and look forward to coming back in the future! GSVR responds promptly to emails/requests however they were unable to fix my problem of no central air during my stay, Thur to Sun temperature ranged from 77 up without fans, maintenance attempted to fix the problem but unsuccessful. Basically my family & I were hot and miserable. Upon checking out via phone,I informed the person on the phone regarding our stay and he stated that the maintenance staff had reported the problem as fixed & he apologized but at the end of the day I was not satisfied with the lack of communication and lack of air, I paid for a unit that was supposed to have central air. The location is great and the people in the community are super nice and friendly (Initially my family were skeptical due to being a minority, however thanks to the wonderful tenants/others in community my family was at ease and felt very comfortable). There were 2 issues which concerned me: 1 being the back patio door lock was broken however maintenance fixed it promptly the 2nd was a major issue which was the cooling system/central air unit broken,it remained 77 and above (maintenance attempted to fix but no success, so Thur to sun my family & I had to endure the heat with no fans/we were hot and miserable). Once the central air unit has been fixed this place will rank at the top of my list of places to stay in Myrtle Beach.